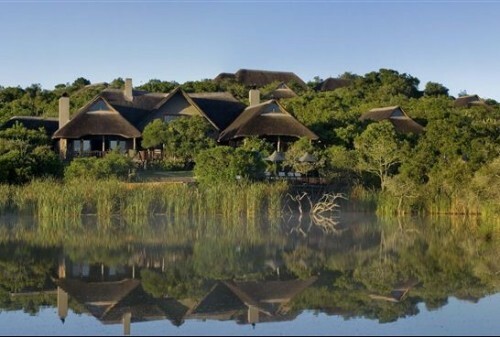 Kichaka Luxury Game Lodge: Kichaka Lodge is ideally situated just over one hour from Port Elizabeth airport. Guests can land at the airport, enjoy a comfortable drive in luxury transfer and within the hour be relaxing, cocktail in hand, overlooking the magnificent Eastern Cape bush and Big 5 game. The main lodge is constructed in stone and thatch which blends seamlessly with the surrounding landscape. It overlooks a large water hole popular with hippo, giraffe, elephant and countless other game. The lounge and dining areas have been constructed so as to give the best possible aspect over unspoilt bush, large terraces stretch over the waterhole provide a magnificent viewing deck. The terrace also extends into a small island creating an enchanting outdoor dining area. You can relax and enjoy a swim in our heated rim-flow pool adjacent to the waterhole or just enjoy sun, cocktails and glorious views on the large pool terrace. Above the lounge is a library come meeting room which overlooks the waterhole, this room provides a quiet place to curl up with your favourite book and can double as a comfortable, fully catered meeting room. We will make sure that you do not miss your favourite sporting events which you can view from the comfort of your room, the large plasma screen – which is set up for special events – or in our cosy lodge bar with feature stone fireplace. The wine lover is well catered for at Kichaka Lodge, our large glass fronted wine cellar offers a range of premier wines, selected by our specialist wine cellar management team, click here to read more. The immediate camp area is secured by discreet electric fencing to ensure safety of guests and to deter elephants from destroying our trees.